It is being reported that in the past 10 years in Israel, our lifespan has increased by 2 full years. It seems that we get an additional 5 hours added to our lives every single day. Barkat is worse than the rioters in Mea Shearim who burn garbage bins and bring a halt to life for the residents. He acts like them and even worse than them. David Jablinowitz is revealing, in bits and pieces, sections of his talks with President Obama. Always interesting, these are particularly so as they discuss the possibility of moving the embassy to Jerusalem. the attitude of giving in to the threat of violence and blaming the victim reigns supreme..
very important... but what's with that mustache??? We are davening and wishing, along with the tzibbur, for the health and recovery of Rav Shteinman who has been very ill over the past couple of days. Yesterday Rav Shalom Ber Sorotzkin asked Ravv Chaim Kanievsky for a clarification on something he had said. Supposedly Rav Kanievsky had been quoted as having said that people could daven that Hashem should grant Rav Shteinman more years than what had originally been designated for him. Rav Sorotzkin asked Rav Kanievsky if he had really said that. The basis for such an allowance would be that Rav Shteinman is a public person, somebody needed by the community, rather than just being a private person. Rav Kanievsky responded that he had indeed said that. Rav Sorotzkin then said this gives tremendous encouragement to the people. Rav Kanievsky's grandson explained to Rav Kanievsky what Rav Sorotzkin had said and explained that it gives great encouragement because Rav Shteinman is very old but we can still daven for him to have many more years - a long life. Rav Kanievsky responded incredulously, "he is very old? Rebbe Preida lived to 400 years old!" The Haredi MKs are once again threatening to pull out of the government unless they get their way. This time the issue is that of the cancellation of the original Kotel arrangement deal. Last week it was threatening about returning the power to decide about work on Shabbos in Tel Aviv (and other cities) to Minister of Interior Aryeh Deri. Before that it was money for yeshivos and IDF draft issues. This reminds me of Lapid in the last government that regularly threatened Netanyahu with pulling out of the government unless his issues were approved. Eventually Netanyahu had enough, got fed up, and dismantled the government, calling new elections. On the one hand, it looks like this could soon become a similar situation. With threats being bandied about so frequently, one day Netanyahu could just say forget it - let's go to elections. On the other hand, Netanyahu doesn't want elections now either, considering the investigations, and considering the polls showing Lapid's growing popularity. He might be willing to put up with mroe because of it. On the third hand, despite all the threats, the Haredi MKs are considered to be very loyal to Netanyahu. They too don't want new elections, considering Lapid's increasing popularity. Perhaps Netanyahu knows that the threats are not real and just for show on the "Haredi street". It seems there position is good enough that they can continue to threaten without risking the ire of Netanyahu.. Eventually, with such an approach, the straw will break the camels back. Here is an interesting difference between American hechsherim and Israeli hechsherim. Hellman's mayonnaise, bearing the kashrut symbol of the Orthodox Union (OU), bears on its label a recipe for "Parmesan Crusted Chicken". Being imported into Israel, someone noticed the recipe and was shocked to see it with the OU hechsher right next to the recipe on the label. Upon being contacted about this, the OU responded that they give the hechsher on the product, the mayonnaise, and not on the recipe printed on the label. In Israel that would never fly. The hechshers here, at least the various Badatzim, take all sorts of other things into account when giving a hechsher. They make companies print separate packaging and labeling for lines of the same product with their hechsher. Eida refuses to certify foods with athletes and actors and actresses on the packaging of the food, for example. They would never certify a product packaged with a non-kosher recipe recommendation. Is it good or bad? I don't know, but it is different. Should they get involved in other issues when giving a hechsher? is there really room to worry that someone might mistake the hechsher for including the recipe for Parmesan Chicken? Are the Israeli Badatzim doing a better job by including all these other issues in their hechsher? You know when you are in the Middle East when someone gets appointed to a ministerial position in your government and to celebrate he announces he is going to throw a party in which he will have 68 sheep slaughtered and roasted, according to the number of years of the existence of the State. And then, not only did Ayoub Kara announce that upon being appointed as Minister (without Portfolio), but he further clarified that all the sheep would be slaughtered in a kosher mehadrin method so that his Jewish friends, including rabbonim, could partake in the celebration. the White House, under the Trump Administration, put out a statement for International Holocaust Remembrance Day, the left out the word "Jews" and simply remembered all those who died. Then, when criticized for not overtly mentioning the Jews, they doubled down and explained that of course it is the Jews but also many others. Some say that talking about the Holocaust itself makes the word "Jews" redundant and unnecessary, as the Holocaust refers to the Jews. Others say leaving it out, considering that while many others were killed, Jews were a specific focus and target of the Nazis, must be an attempt to scrub history a bit. Basically, I think it is just pretty stupid to leave out the Jews from the statement, but probably not indicative of anti-semitism. I also don't know why we need so many holocaust remembrance days and events throughout the year, especially when the world isn't using them to learn the lessons and stop the genocides and mass murders and other horrors around the world in places like Syria and Darfur and others..
MBD has been one of the most vocal, if not the most, Jewish performers to speak out against the sharing of music on the Internet, and he does so here again, after a new, unfinished, song (called "shamati") of his was leaked on the Internet. Some suspect this is all just a PR move for his new album soon to be released, to pique interest. Perhaps it is, perhaps it isn't, but I am not posting it here, just in case it isn't. Some say he is the last one to be talking about these things, considering how much music he has stolen from non-jewish singers and used in his own compositions. And some say that he needs to come to terms with the new (not really so new, as even he himself has been railing about this for years now), and stop making such a big deal out of it, as it doesn't help anyway. are the Badatz hechshers feeding us neveilos and treifos? This is another one of those situations in which somebody said something provocative and I just wish they had given some more details and explanation.. 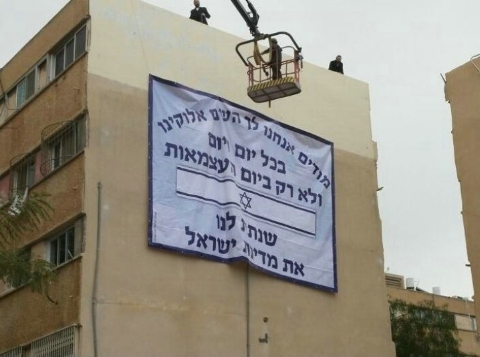 The rav of Petach Tikva, Rav Micha Halevi, responded to those working against the Rabbanut kashrut division, in light of the proposed law to dismantle the Rabbanut kashrut, and took the position that the Rabbanut kashrut is extremely critical to kashrut in Eretz Yisrael, and without it, if we only had the various "Badatzim" to rely on, the Badatzim would be feeding us "neveilos and treifos". He said, "only the Rabbanut is what causes us to not have Neveilos and treifos in Israel". Rav Halevi went on to speak about other aspects of kashrut as well, such as saying that if a mashgiach does not show up to a restaurant as frequently as he should be showing up, as has been found to happen and is one of the main complaints about the Rabbanut (and other hechshers), it is a problem that needs to be fixed, but it does not cause a problem in the hasgacha's reliability. The restaurant that was checked and has a hashgacha has a chazaka of being kosher and one can rely on that - even though the hechsher has to fix its problems and send the mashgichim when they are supposed to. Rav Halevi also accused those rabbonim who spoke against the Rabbanut and claimed it is unreliable because some mashgichim don't show up as frequently as they are supposed to. He said they are incorrect and these rabbonim are ignorant in halacha and are speaking with an agenda. oh, how I wish he would explain and reveal some of his secrets behind his statement that the badatzim would be feeding us neveilos and treifos, if not for the Rabbanut.. The claim is not new, about there being serious problems in the various Badatzim (including the Eida Hachareidis, despite its reputation), though I have never heard it expressed quite this way before. The biggest problem, in my opinion, is the lack of transparency in the Badatzim. Nobody knows the standards by which they work, and nobody knows the processes employed to uncover, and fix, problems. We just trust them by reputation alone. The Rabbanut, being a public body, has a much higher level of transparency to the public. They say openly they rely on certain leniencies in order to be able to provide kashrut to the masses, but they are transparent about what they do. Yediot shows the image of a soccer player who scored a goal, put a kipa on his head and said a prayer (shma yisrael, as reported elsewhere) in celebration. Yediot asks in its tweet if this should be considered a provocation or is it legitimate? Provocation? provocation to what? why and how would putting a kipa on be considered a provocation? I am thinking of Tim Tebow off the top of my head, but many athletes perform religious ceremonies of sort, usually more subtle than Tebow's flamboyant ceremonies. It seems to be a very common part of sports celebrations, but when Jewish it is provocative? And, again, what is it provoking? Minister of Internal Security Gilad Erdan has announced a change of policy regarding marijuana use. According to Erdan, private marijuana use will no longer be considered criminal but will be subject to fines. The authorities have to decided to not bother citizens in their homes for private use but to focus on marijuana use in public places. Regarding private use, first offense will result in a fine. Second offense will result in a doubled fine. Third offense will result in a criminal record being opened. At the fourth offense, the police will consider an indictment. Kids, however, will be subject to slightly stricter treatment. First offense will result in conditional treatment. Third offense will result in criminal treatment. Basically, Erdan says society looks at marijuana use differently nowadays and considers it more legitimate. People should not have their futures, and ability to find employment and be a part of society, hurt by a criminal record for something society considers legitimate. little by little... eventually maybe it will even be legal under certain conditions..
One month ago, we released the song and video "Yoimum". The song had started as a little jam that came to me in the days leading up to Rosh Hashanah. It quickly became a favorite tune for when we were sitting together and and jamming, which of course happened quite a bit over the course of Tishrei and it's many meals. It was during one of those meals, at my friend Oizer's suckah, that I was sitting with my good brother and everyone's friend; Duddy Deutsch​, singing it together with the many others sitting around the table. The video that was recorded then spread quickly. Right after the yomim tovim, Zevy Fried called and said; "Meilech, we need to record this yesterday." The rest, as they say, is history. With that, here's the video that got it started. Haredi journalist Benny Rabinovitch went on an interesting rant regarding Naftali Bennet and Rav Metzger, in light of the plea bargain agreement sending Metzger to jail for 3.5 years. Basically, Naftali Bennet criticized Metzger for the crimes he committed and for the chilul hashem he caused. Rabinovitch got upset and went on a rant against Bennet accusing him of never speaking out against criminals within his own camp - the Dati Leumi camp. He called Bennet a rasha - evil, wicked, person - for this. He said it is obvious that he has hatred for anybody who seems to be Haredi. He also claimed that Bennet spoke out against Metzger just to divert attention from his situation with Amona and the residents being angry at him. Rabinovitch pointed out, as an aside, that Metzger really isnt Haredi and did not learn in Haredi yeshivas, and only is thought of as Haredi because the Haredim supported him for the position of Chief Rabbi back in the day. 2. Bennet did not say Metzger is Haredi, so I am nto sure why Rabinovitch thinks Bennet's criticism of Metzger has anything todo with Bennet thinking of him as a Haredi. Maybe he is criticizing Metzger as a Dati Leumi. Or a s a Chief Rabbi. Or as a person. Why does Rabinovitch accuse Bennet of attacking him as a Haredi, and then go on to say he isnt Haredi. Is he or isnt he? If he isnt, then Bennet's attack also had nothing to do with being Haredi. And if he was, then own it and dont say he really wasnt. 3. Rabinovitch's criticism might be right or might be wrong. I dont know. Bennet did not go on the attack against the recent accusations against Slomiansky. But then again, Bennet also said nothing about Metzger until there was a final plea bargain agreement. Maybe when Slomiansky ends up in jail Bennet will criticize him as well. 4. Rabinovitch's criticism might be right or might be wrong. I dont know. However, Rabinovitch also does not criticize and attack the criminals within his own, the Haredi, camp. He did not criticize Metzger, but maybe Metzger isn't Haredi. I dont remember him criticizing Aryeh Deri, or the rosh yeshivas, mashgichim or rebbeinm who were ever arrested for molestation and abuse, or Haredi heads of gemachs who went to jail for fraud and tax evasion or Haredim who went to jail for drug smuggling..
MK Yisrael Eichler (UTJ) has proposed law that is almost a copy, with slight, but major, changes, of another law proposal on the docket. MK Miki Levi (Yesh Atid) has a law proposal on the docket that would exempt people leaving the frum community and becoming secular, aka in Israel "chozrim b'shailah", from paying the monthly fee to Bituach Leumi because of the difficult financial situation they experience throughout the process. According to Eichler, those who are "Chozrim b'tshuva", secular people joining the frum community, also suffer from financial difficulties, and should also be exempt from the Bituach Leumi payments. Eichler took Levi's proposal and copied it word for word, changing only the words "chozrim b'shailah" to "chozrim b'tshuva", and submitted it. Eichler explains that baalei tshuva suffer from financial difficulties as they have trouble finding employment and have trouble learning vocations while going through the sharp change in lifestyle, along with the dramatic differential in knowledge and lifestyle acclimation. Exempting them from the Bituach Leumi payments will help them integrate into their new society and help them overcome their difficulties. Good idea. I like it. If one gets it, the other should as well. Though I dont know why either side should get it. Maybe an arnona discount, or a small tax break, but why Bituach Leumi? I don't see the exemption, for either side, defined by any limits. Or by definition. What constitutes a baal tshuva that would qualify - someone who goes to a few classes can apply for the exemption? Do you need a note from a rabbi that you have kept shabbat and kashrut for 6 months to get the exemption? Do you need to be registered in a yeshiva? What is considered a baal tshuva? And, can Baalei tshuva who have already been frum for 10 years, or 3 years, or 25 years, or 1 year, qualify for it? and someone who becomes frum the day of the passing of the law - does he or she get the exemption for 1 year, for 10 years or for 25 years? and the same questions apply for Miki Levi's law - do chozrim bsheilah get the exemption just by saying they are no longer frum? Do they need a letter from a community leader saying they have been witnessed driving on Shabbat and eating shrimp? Do they get the exemptions for 1 year, 10 years or 25 years? etc. or don't pass either law. Fox News is (and some Israeli sites are) reporting that the new US State Department under President Donald Trump has decided to put a hold on transferring the money former President Obama had approved to be given to the Palestinians at the last moment as he was leaving office and circumventing the Congress that had refused to approve the transfer. The Trump administration says it will be reviewing the decision and look at the payment and consider making adjustments to it in line with the administrations priorities. Again, it isn't the money that bothers me, and Trump's review of the money does not excite me.. It is the process. Obama tried to go around the government's back at the last minute when nobody was looking and do something outside of the process, in line with his heart when nobody could any longer say anything. Trump is merely saying that is unacceptable and it needs to go through the proper channels. In the end he might approve of it, or make adjustments and approve of it in some way or another - with less, or more, money being transferred. And that will be fine. It is nothing new that the USA sends money to the Palestinians. Heck, the Israelis send money and goods to the Palestinians on a regular basis. Whatever happens with the money in the end is fine. As long as we know it went through the proper channels. According to Kikar, Rav Yitzchak Zilbershtein, rav of Ramat Elchonon neighborhood of Bnei Braq, was recently asked a detailed question about a woman driving. An avreich asked specifically about his wife being able to drive. Knowing that it is a tzniyus problem, can she drive because the alternatives are worse, or at least no better? 1. she could take a bus. This too has tzniyus problems as there is no mechitza and men and women are mixed and the bus is sometimes crowded, and the drivers are often not Torah-observant people. 2. She could take a taxi. This too is problematic, as most of the drivers are not Torah-observant. And, even with a frum drivers, it is a situation of a private car ride with a man and a woman secluded together. It is at least quasi-yichud. 3. she could walk. This [resents a problem with long distances and both the ability to walk them and the amount of time it would take, but it is also a tzniyus problem as she is exposed for other strange men to look at her while in the street. The avreich concluded hsi question by saying that the option of her driving a car seems to be the best (or, least bad) of them all. So, can she drive a car? Rav Zilbershtein responded saying that her driving is actually the worst of all the options. bus, taxi and walking present problems, but she could be careful to not cause men to stumble. There is, however, no intrinsic problem with tzniyus with any of these options. Driving a car, however, is completely against the rules of tzniyus for a woman. Besides for the various problems it causes and for her need to be in contact with men, it is actually prohibited for her to drive. Rav Zilbershtein explained a verse in "tefillas haderech" in which we pray for a safe trip that says "says me from dangerous animals on the way". He explained that this also refers to drivers who do not follow the rules of the road, and they turn the situation on the road to one of war, and war is not for women. Honestly, to me, that seems to be a real stretch. Like shooting an arrow and then drawing the target around the arrow after it hit. But, to go on.. Rav Zilbershtein relates a story of a woman who was driving, a very important woman very involved in chessed, and she drove into a tree and became handicapped for the rest of her life. Rav Yechezkal aAbramsky had said about that case that it was because she was driving, and a woman should not. Rav Zilbershtein went on to blame (at least as one of the factors) the high rate of traffic accidents on Israeli roads, in which many good people have been killed, on women driving cars - again, from a spiritual perspective. In addition to the spiritual problems, he adds that women cannot deal with the high pressure situations and sometimes cause these accidents. The only way a woman could drive, according to Rav Zilbershtein, is in a situation of great need, such as a woman who must take her handicapped child for treatments, and other similarly unique and extreme situations and then a specific question must be asked to a rav. Rav Zilbershtein also adds that driving abroad might be a different situation and rabbonim there should be asked when relevant. I dont know when Rav Abramsky said what he said, but he died over 40 years ago, so it was definitely not so recently. Being that it is so common nowadays for women to drive, I wonder how it could really still be considered such a serious tzniyus and spiritual problem - not including certain extreme elements that still consider it so - elements I was not aware Rav Zilbershtein is associated with. Far be it from me to argue with Rav Zilbershtein, but I do wonder about that. Pointing to one case of a woman driving and getting into a bad accident is nothing but anecdotal. Many men and women, unfortunately, get into bad accidents. Crazy drivers can be found among both men and women, as can their victims. In the original question asked, I am not sure what the relevance is in pointing out the lack of Torah-observance of the bus drivers. The taxi driver's observance is understandably more relevant, as the driver would be alone in the car with the wife. A bus driver is driving a bus filled with many people, so I wonder what relevance his level of observance has. it is a package of chicken "pargiyot" - boneless chicken thighs. In addition tot he sticker form the store with the price and weight, it bears a sticker claiming to be kosher under the supervision of the Rabbanut of Kfar Kassam - an Arab town - with the mashgiach's [Arabic] name and phone number. At first I thought this was a cute joke and the picture had been photoshopped. Nothing worth posting about. The kashrut sticker looks to be photoshopped in to me, and the other packages of chicken behind it don't have a similar sticker visible (though maybe it is just not visible) but also present on those. 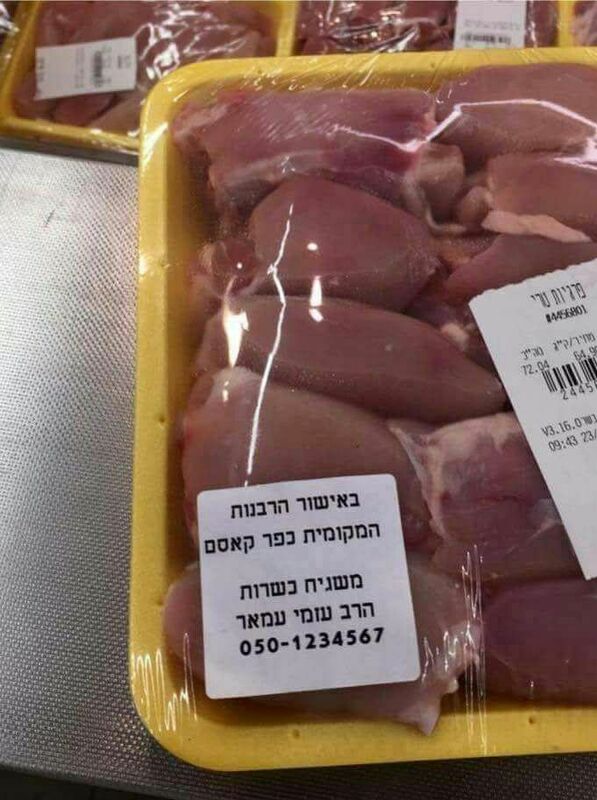 A friend of mine jokingly pointed out that it must be real as the price for the chicken as seen on the price sticker is so high it could only be for kosher, and probably mehadrin, pargiyot. It seems the Rabbanut has seen this photo as well and is taking it seriously, which makes it post-worthy for me. At least, seriously enough to investigate. On the Rabbanut Facebook page they posted the picture and said that while it looks like a joke they are looking into it. They mention that, obviously, no such Rabbanut (of Kfar Kassem) exists, and the phone number listed is not real. The Rabbanut does point out that any area without its own religious council, including Kfar Kassem, responsible for kashrut would give certification using the name "הרבנות לכשרות ארצית" - Rabbanut for Kashrut around the country. While it almost definitely looks like a photoshopped joke, if you come across it, or any other suspicious looking kashrut certification, contact the Rabbanut (at achifa@rabbinate.gov.il or 02-5313163) and let them know. I have done so on a number of occasions, and they really do look into the issues raised. It is now being reported that in the last hours of Obama's presidency, as he was about to leave office, President Obama "quietly" released $221 million to the Palestinian Authority. Congress was notified just hours before President Trump took his oath of office. It seems this money had already been slated to be sent to the PA, but GOP members of Congress had been blocking the transfer. In his final hours in office, Obama found a way to sneak the money out behind their backs. The money itself does not really bother me so much. Obama, and the USA, gave Israel much more over the years. This is not "so much" money, and the USA has given money to the PA before. However, the timing bothers me. Just like with the recent refusal to veto the vote against Israel in the United Nations Security Council - Obama did something at the last minute when he no longer had to feel obligated to anybody, the money transfer now is also a last minute act when he no longer had to answer to anybody. these last minute acts show where his heart really is. Obama must have really wanted to give the PA that money, rather than let the government go through its normal processes. He could have left it for the incoming President and Congress to deal with, and they might or might not have released the monies, but it would no longer be Obama's issue. His extraordinary efforts to get the PA this money indicates how important it is to him. Dr. Einat Wilf, former member of Knesset, on the uniting power of Zionism. Part of a series profiling unique perspectives and stories relating to Zionism. and I read an article somewhere the other day with some background. They are not Jewish. The father, a musician, was looking for music for his daughter to use in the competition. He was checking various singing competition shows and came across this song sung by Uziah Tzadok a couple of years ago in a competition and he liked the way it sounded. He does not even know what the words mean, btu they learned the words and the song and sang it to perfection..
and the original, from Zohar Argov.. In order to deal with the Haredim, we would need to bring in someone from outer space, from outside the sector. Just like by others there is conflict of interest, by us there is coordination of interests..
-- MK Yaakov Margi (Shas), head of Knesset Education Committee, discussing the situation of Haredi girls still sitting at home not accepted into seminaries and the inability of the authorities to deal with it and pass the law to change the registration method to regional, as UTJ continues to coordinate with the heads fo the seminaries and block the legislation. Various news websites yesterday were reporting, based on a source in the Trump administration, that today they would start talking about and looking into moving the US Embassy from Tel Aviv to Jerusalem. Without having any idea how those discussions will conclude, and with the default expectation being that most people have expected that Trump will renege on his campaign promise as has every president until now and not move the embassy, I would point out that just having this "discussion" about the possibility is already more than any previous president has done about this. The others all promised during their campaigns and then just went along with the State Department that told them to drop the idea, too dangerous, taking sides, etc. Trump holding a discussion with his team about it and figuring out if it is something they should do or should not do, is already progress. Rabbi Marvin Hier of the Simon Wiesenthal Center delivered a prayer at Inauguration Day 2017, after Donald Trump and Mike Pence took the oath of office. The first Orthodox Jewish rabbi to give an invocation at a presidential inauguration said that the biblical passages included in his approximately two minute address were carefully chosen to convey specific messages. Rabbi Marvin Hier, dean and founder of the Simon Wiesenthal Center in Los Angeles, said that he chose verses that, in addition highlighting the concepts of being actively involved and helping others, focused the spotlight directly on the State of Israel. In a Saturday night radio interview on Zev Brenner’s Talkline radio program, Rabbi Hier said that his statements about Israel were directed not just at President Trump and the American public but the entire world and called Senator John Kerry’s remarks about Israeli settlements blatantly false. According to a report on Kikar, the Vishnitz neighborhood of Bnei Braq and Los Gatos, California have a lot in common. Both communities are upset at Waze. Though for slightly different reasons. Residents of Los Gatos, California were suffering from heavy traffic on the residential streets as Waze would redirect drivers trying to avoid traffic through the town's quieter streets. All that redirected traffic suddenly made the streets dangerous for the kids and brought in more traffic, pollution and noise. They tried to get Waze to stop redirecting traffic through their residential area, to no avail. Eventually people resorted to falsely reporting traffic jams so that Waze would not route drivers through their streets. I do not know how that situation was resolved, if at all. I also remember similar stories being reported from other cities across America as well. In Bnei Braq they are now experiencing something very similar. People from neighboring towns are being routed through the small and narrow streets of the Vishnitz neighborhood of Bnei Braq to get to Highway 4 via quicker, less congested, route. The new traffic and noise seems to bother the residents of this neighborhood less, and the tzniyus problems of the secular drivers sitting in their cars on the neighborhood streets bothers them more. They are looking for ideas how to put an end to this problem. I would recommend they start off the falsely reporting traffic jams, just to get Waze to not send drivers on these roads. And then, if that is not enough, they should petition City Hall to close off the roads so they will not continue to be used as thoroughfares. There are a few things about this report that bothers me. According to the report in Behadrei, there is a Haredi school in Maale Adumim. This school requested assistance from city representatives and the head of the education department told them to leave Maale Adumim and to go instead to Jerusalem. MK Moshe Gafni (UTJ) protested this response saying there are clear instructions from above to not give Haredim a foothold in Maale Adumim. It also seems there is an implicit threat in Gafni's protest to not support the request for annexation of Maale Adumim. If Haredim live in Maale Adumim, they need, and deserve, schools that are fitting for their lifestyles and preferences. 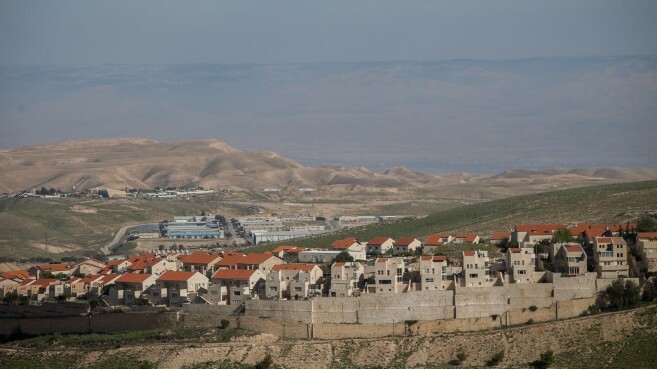 I don't know if Maale Adumim is an open city letting anyone in, or a closed community that requires approvals based on fitting a lifestyle profile. If it is a closed community, then it is understandable - there are plenty of those, and attempts to "break in" with a different lifestyle often fail. If it is an open city, then they have to accept Haredim who want to live there just like they need to accept anyone else. I also have a problem with Gafni. Not with his protest for this school - that is legitimate. My problem is the hypocrisy. 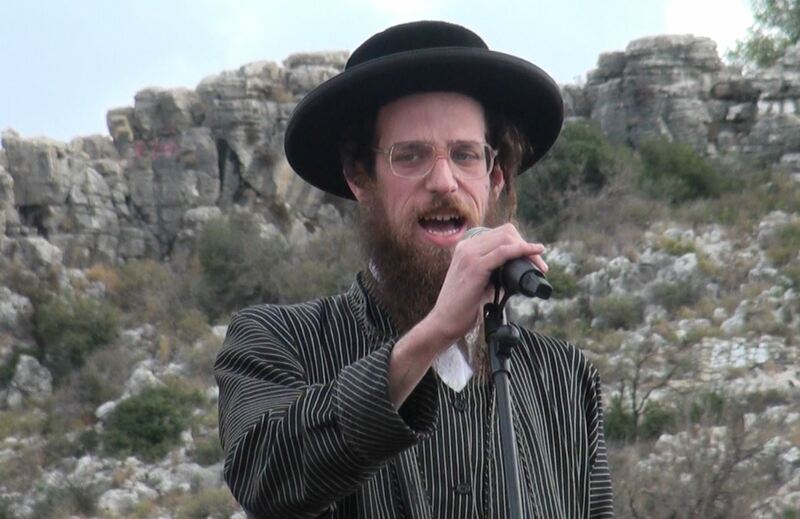 When a Haredi yeshiva high school (Chochmei Lev) was offered plots/buildings in different mixed neighborhoods of Jerusalem, but were pushed out by askanim and residents, Gafni did not go out and defend their rights to be present in those areas, because he opposed the institution. What is good for Gafni's goose was not good for his gander when it came to schools he did not like in the same situation. Further, show me a Haredi town that is tolerant of other communities entering and joining and using resources? Do Beitar or Kiryat Sefer or Modiin Ilit allow dati leumi or secular communities to join and then fund their schools? I agree with Gafni that the haredim in Maale Adumim should be funded like anybody else, but I'd like to see Gafni support opening up Haredi areas to others the same way he expects others to open up to Haredim. this is a picture of an IDF ceremony on Friday at the conclusion of an officer's training course in the Intelligence corps. The graduates of the course include two religious women who are pregnant and have an exemption from wearing the IDF uniform and are now officers in the army. in Jerusalem a protest near the train tracks of the Jerusalem Light Rail led to someone getting run over by the train (only lightly injured). the protest was against the drafting of Haredim to the IDF..
even in China, in Tiananmen Square, back in 1989, the tank train didn't run over the protester that stood in its way. According to a report in the Jerusalem Post, Ivanka and her husband, Orthodox Jews who "rest" on Shabbos, have received an interesting psak that would allow them to travel by car this Friday night after the inauguration of Ivanka's father, Donald J Trump, as President of the United States of America. According to Mark Zell, chair of the Republican Party in Israel, who described the situation on Radio Kol Berama this morning, the psak takes into account safety issues, and compared this to a situation of pikuch nefesh. No mention (in the article) of any details beyond that, or the name of the rabbi who issued the psak, leaves me wanting for more information. Surely if it were pikuach nefesh this would be allowed, no questions asked. I wonder how this is determined to be the case. Every time the daughter of the president wants to go anywhere outside her own house - does it get the status of pikuach nefesh? Is there a credible threat right now that they took into account while in a regular situation the answer might have been different?. This Rabbi Yanklowitz seems to be an interesting character.. I have no idea who was wearing this at the White House visit of the Chicago Cubs yesterday... it probably was not Theo Epstein.. In a Nefesh B'Nefesh program with Toldot Yisrael at Beit Hatfutsot on January 3rd, 2017, Smoky Simon discusses the role Machal volunteers played in the Air Force in Israel's War of Independence. Smoky Simon was born in South Africa on 24th April, 1920. In World War II he served as a navigator/bombardier in the South African Air Force and the Royal Air Force from January 1941 to November 1945. He arrived in Palestine on 9th May and signed-on as volunteers for the Israel Air Force. In the War of Independence Smoky flew 24 operations in diverse aircraft and in May 1948 he was appointed as Chief-of-Air-Operations of the Israel Air Force. What does PM Benjamin Netanyahu have in common with a senior leader of the Eida Hachareidis? Police raided Eida offices in Mea Shearim today looking for Shimon Sisa's office. Sisa is being investigated for issuing fraudulent psychiatric papers to get youth exempted from the army. The police met violent opposition and quickly left the area after not locating his office. Netanyahu said the same about the investigation into his affairs with Noni Moses that are suspected of being breach of trust and bribery and perhaps other crimes. The forces of the Left in the media and the army are trying to erase from the public awareness the heroism of the citizen that killed the terrorist in Armon Hanatziv, because the citizen acted like a man - a fact that is in opposition to the narrative that the Left in the media are trying to instill into the public. On the other side of this, the female officer who shot at the terrorist is now being praised as a hero, for the same reason. When Hamas watches the film, they get the impression that IDF soldiers ran away like women from the scene of the attack. There has been a fight going on in the southern city of Arad between the secular residents and the community of Gur chassidim. Without getting into the details, because from afar it just seems to be the standard fight of secular residents not wanting the growing charedi community to continue moving in, the basic animosity has now turned into some fight being waged on signs around the city. The Gerrer chassidim, not using social media or other digital forms of communal discussion, have been posting signs up around town to encourage a more religious environment - signs that say things like "In Arad people eat kosher" and "the children of Arad wear kippot". the secular residents turned to the courts to have the signs removed. The Gur representatives argued that these are political signs in nature and they have their political discussion via wall signs rather than using social media. The judge sympathized with the argument, but chose to reject it anyway and order the signs to be removed. An appeal to the Supreme Court by Gur to have the signs allowed failed and the municipality of Arad was given legal permission to remove the signs. This is just a stage in the fight, as Gur says their coming signs will have clear political messages and will reveal clearly what is actually happening in Arad, who is stealing from city coffers, who is mistreating the children of Arad, and more. This last sign is the interesting one in this fight.. The sign reads "We thank God every single day, and not just on Yom Haatzmaut, for giving us the State of Israel"
forgetting about the fight.... they publicly declare thanking God for the State of Israel. They did not say "eretz yisrael", but "medinat yisrael". they used blue and white colors on the sign with a picture of the flag of Israel.